I am so excited to announce something that has been in the works for weeks now! Woo hoo! So here's the deal...during the week of June 18-22, Kristin and I are teaming up with 18 amazing bloggers (yes, I said 18!!!) 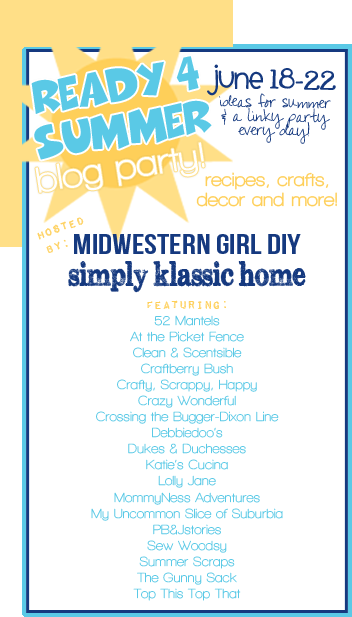 to bring you an entire week of food, crafts, kids' stuff, home decor & entertaining all centered on SUMMER! Yay! Each day we will be featuring 6 different posts on 6 different blogs...so for every theme, our readers will get 6 awesome summer ideas! Just check here and Simply Klassic Home every day that week and we will lead you to our guest-posters. 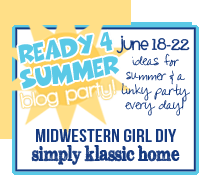 Kristin and I will also be having a linky party for each theme, so that everyone can link up their ideas and we can all be inspired by each other! I'm so excited for this I can hardly stand it! So, you wanna see who will be participating in this par-tay? Yay! Yay! Yay! Can you believe it??? Mark your calendars! It's time to get excited!! !